If you are a Jeep owner, you probably know that the appearance of the soft top windows plays a large part in how good your vehicle looks and how good it will continue to look for years to come. But soft top windows can be a little tricky to keep clean and maintain. Many people try to use chemicals that they shouldn’t use and some use brushes and other household appliances to clean their soft tops with that can stain and/or destroy the fabrics and windows. It is important to know how to clean them properly and what chemicals you can and can’t use. With that being said, what is safe to use then? How do you keep your soft top well maintained? 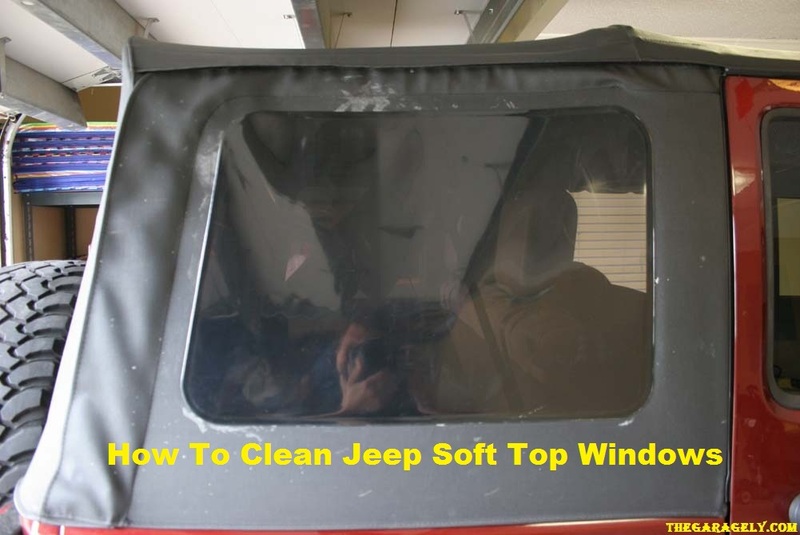 Well, here is a step by step guide on how to keep your Jeep soft top clean and in pristine condition. Firstly, let us focus on your Jeep soft top windows. Your soft top windows are not like other kinds of windows, so characteristic glass cleaners are not going to work properly on them. You should avoid products like Windex and 409 because these products contain either alcohol or ammonia, both of which dries out the natural oils in your soft top windows and can cause cracking and even discoloration. Another thing you should avoid is using paper towels. They may seem harmless enough to wipe down a window with but, in actuality, it can scratch your windows. What you want to do is use a microfiber towel. These are the best kinds of towels to use on Jeep soft tops and you can buy them at almost any automotive shop. What you want to do is wet the microfiber towel and wring it out really well. You want it damp when it reaches the windows, not soaking wet. Do not rub the windows in a circular motion, simply swipe it clean, gently, and use a clean side of the cloth each time you swipe. They also sell cleaning solutions, specifically for soft top windows, that you can purchase at auto shops too. These cleaners are not like Windex or 409 and they are completely safe to use on your Jeep soft top windows. Your windows will dry naturally, but feel free to dry them quicker with a microfiber cloth, if you wish. Another great thing you can do is use a sealing spray to help protect your windows. This is another product you can purchase at just about any local automotive shop. You simply spray a protective coating over your windows, after you clean them, and let it sit for around five to ten minutes. Then you simply dry it with a microfiber cloth and do this gently. This protective sealant helps to keep your windows safe from harsh sun rays, water, dirt, oils, and grime. Secondly, you have your soft top fabric, which is easily cleanable with a simple spray down. You can simply use a water hose to wash off the grime and dirt from your soft top fabric. You can even use a pressure washer too if you’ve got some stuck-on grime. Just make absolutely sure to hold the nozzle at least 2 feet away from the soft top, to avoid damaging it. If there is some deeper dirt through that water just won’t get out on its own, then you can consider buying an auto shampoo. Once again, you can find this product is available at most local automotive shops. Do not use any kind of chemical that isn’t specifically for soft top cleaning because it could stain or even damage your soft top fabric. You can even use an interior cleaning brush to gently wash the dirt out of the fabric. Do not scrub the fabric too roughly and do not brush using a circular motion. The circular motion goes against the natural shape of the soft top fabric and it’s simply too rough on it. Over time, rough cleaning can actually damage your soft top fabric, even cause tears in it; simply use gentle swipes back and forth with your brush. To get the dirt out of a corner or a seam, just gently tap that area with the end of your brush and knock the dirt loose. Make sure to rinse the fabric out, thoroughly too, when you are finished. You don’t want to leave any soap in the fabric because it can cause a yucky residue to form; not only that, but it can also cause bacteria to grow. You should use a shammy towel to dry it thoroughly. Again, the type of cloth you use to wipe it down is very important. You want to avoid Terry towels and paper towels because they will leave unwanted papery residue behind, so avoid using those on the soft top fabric. You should also air dry your soft top too, once you get as much water out of it as you can. It is important to make sure that the fabric dries quickly and thoroughly. This will prevent the growth of bacteria. You can also buy protective sprays for your soft top fabric as well. This spray helps keep moisture out and helps to also prevent the growth of bacteria in the fabric. And there you have it! Maintaining your Jeep soft top doesn’t have to be a difficult task. Just make sure you watch out for what chemicals you use and what cleaning appliances you use and make sure to use only specified brushes and towels to clean and dry. If you’re ever in doubt you can always call your local auto body shop to ask them about proper cleaning and maintenance procedures, however, this list here should cover all of your basis.